A lovely stack of finished beeswax wraps in different sizes. 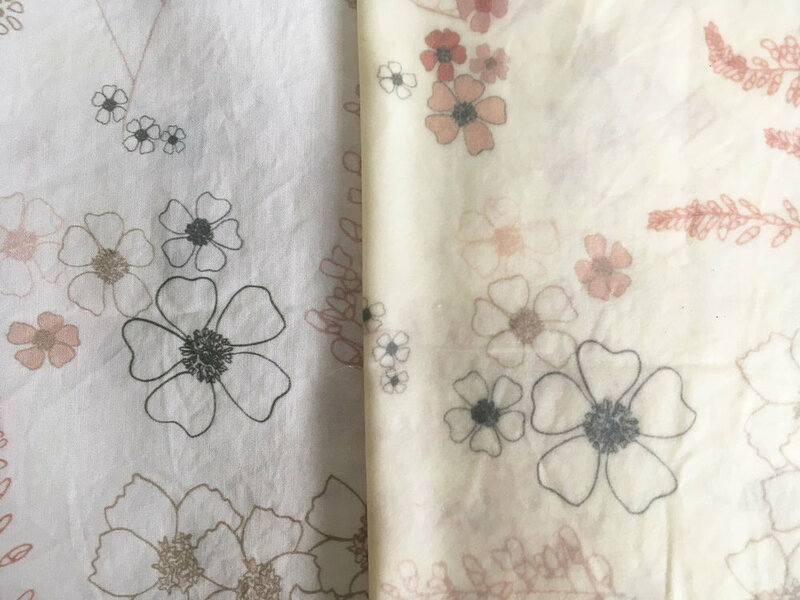 I promised a follow up blog from my recent post Can you make money selling Beeswax Wraps? Well here it is! Cut your fabric to size. Use pinking shears to avoid fraying. Think about what you want to use it for. Half an avocado or a small block of cheese? 6” is ample; sandwiches for lunchboxes go to 8” square, for covering large bowls go to 12” square and loaves of bread 18” - 22” square depending on your loaf sizes. Just experiment with sizes - see what your own personal preferences are. TOP TIP: I like to do an extra large one and then cut it to size once it’s in beeswax form. It’s easier to cut! Preheat your oven to 150-160˚C (gas mark 2 or 3) I started lower but turned it up so the mixture would melt better - my oven isn’t very good though. Experiment with yours. Line a baking tray - Get a baking tray - the largest you can fit in your oven - and line it with baking paper. Measure out the recipe - using the measuring spoons measure out 1.5 tbsps of Beeswax pellets, 1.5 tbsps of pine resin powder and 2 tsps of Jojoba Oil into the bowl. Make a bain-marie - Put the bowl over a pan filled 1/3 of the way up with water and placed over a gentle heat. This method slowly melts all the ingredients together. This takes between 5 and 10 minutes. It should have no powdery texture from the resin - wait until the mixture is totally melted and is a smooth liquid. Warm up the tray - Whilst I’m waiting for the mixture to melt I put the tray in the oven to warm up. Since it’s on a low heat there is little chance that the fabric will catch fire but obviously keep an eye on it. (Or just warm up the tray and baking paper). The reason I have found this technique to be useful is because when you’re brushing the mixture onto the fabric it can start to solidify and get very sticky upon contact with the cold fabric and tray. Warming it up makes it easier to apply as the mixture won’t have as much chance of setting. Brush on the mixture - with a paintbrush brush the mixture over the fabric until it is entirely covered. (I think you need to experiment with your coverage. Putting more on makes them cling better but you might be looking for a less tacky finish). NB: You will notice my fabric below has been folded over because it’s too large for my tray. This is fine and works well but I wouldn’t try it for your first wrap just because it’s a bit fiddly. You need to turn it around half way through heating and apply more to the back to ensure the mixture has been fully absorbed. A large wrap can be folded over. Put it in the oven - since the mixture has already been melted there could be an argument that this step is unnecessary. After all the point of putting it in the oven is to melt the wax (there is another method where you sprinkle the ingredients directly onto the fabric and then transfer to the oven). As I mentioned above I found that the mixture starts to solidify during the painting process so putting it in the oven and then brushing it all in again once its all melted in is the best way to get a smooth finish. The method where you sprinkle the ingredients directly on the fabric didn’t work for me. I kept getting lumps of yellow resin that stained my fabric. Take out of the oven - what does it look like? Are there any lumps? If so spread the mixture back and forth on the cloth to even out any lumpy bits and put it back in the oven to melt more. Paint the back of the fabric if necessary. Once you’re happy it’s all melted and is evenly coated then take out the fabric using tongs or grabbing the corner of the fabric between finger and thumb - it can be a bit ouchy this way however! Waft gently in the air for a bit and peg up to dry. I think they can be used more or less straight away but I like to leave it 24 hrs. They do have a smell of pine on them which at first I was unsure about. Would this smell contaminate my sandwiches or the bread I wrapped? Well, the good news is it doesn’t. And, as someone pointed out to me recently, cling film actually has a horrid, plastically smell. I prefer pine any day.